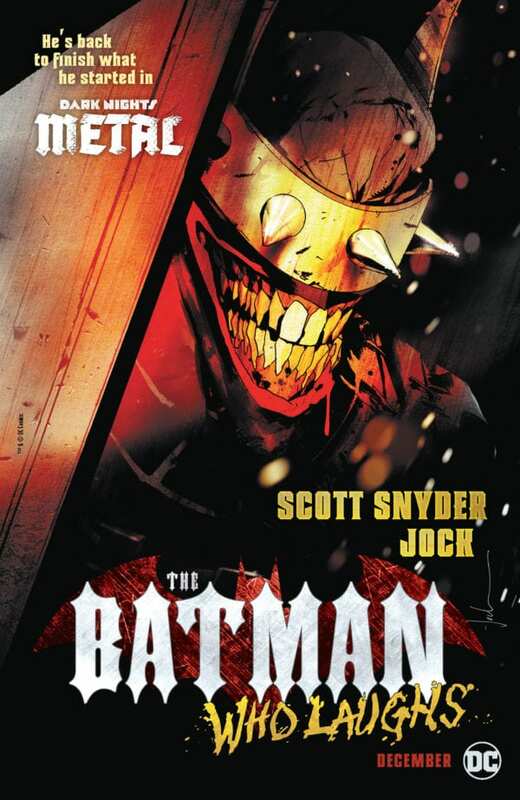 THE BATMAN WHO LAUGHS 1 Review 10/10 HAHAHAHAHAHA adds dark humor, a Grim Knight, and a horrifying twist to a Gotham beset with a nightmare in the flesh: the Batman Who Laughs. 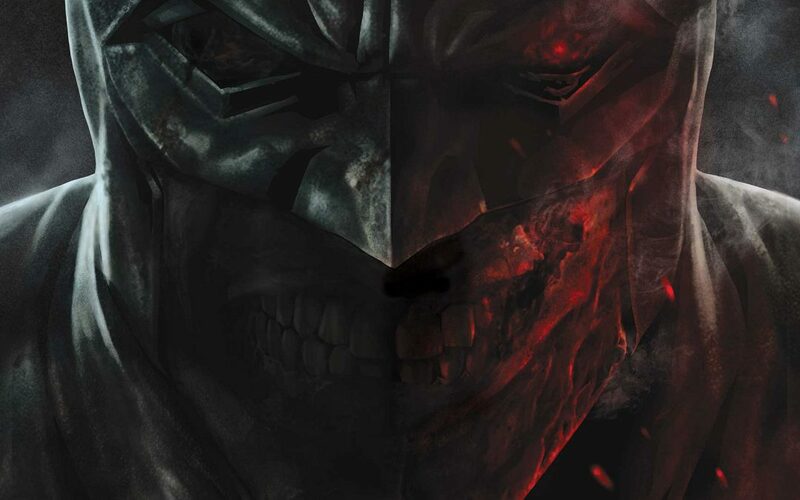 How did the Batman Who Laughs survive the epic close of Dark Knights Metal? 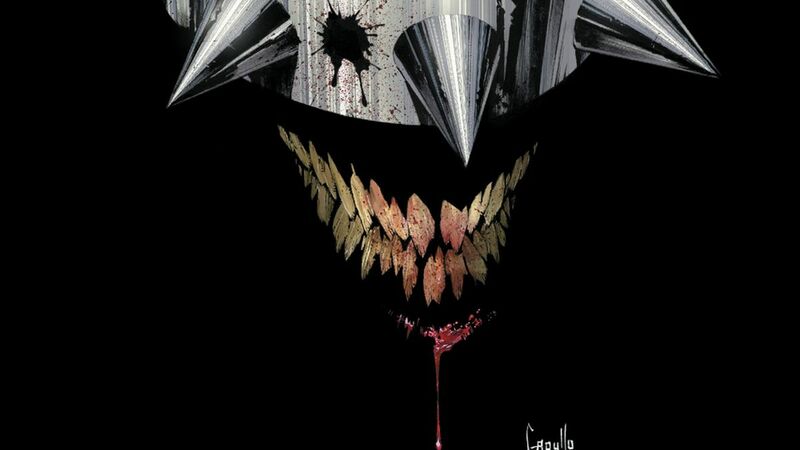 Why has the Batman Who Laughs resurfaced? Who has he got by the chain this time around (last time it was a slew of evil Robins from the Dark Multiverse; see “Too F$&%*N Metal DARK KNIGHTS METAL 6 Shreds All!” for more info)? What can Bruce Wayne possibly do to contend with a Batman who always wins, laughing all the way, no matter the cost? 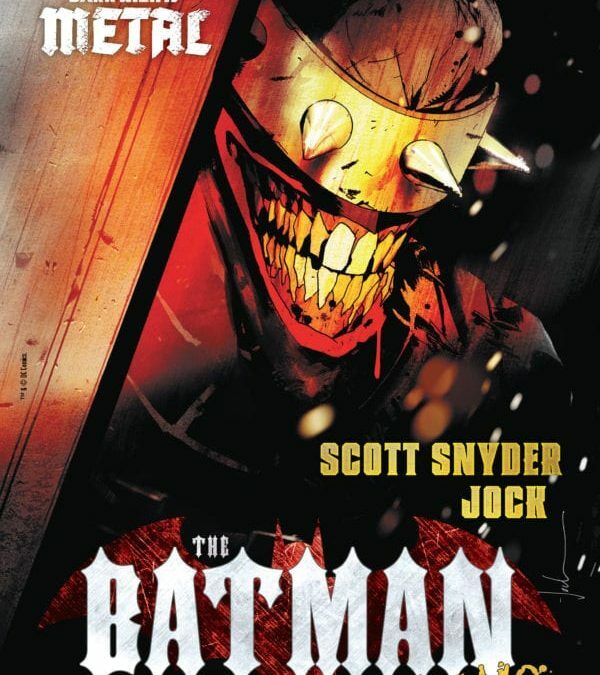 THE BATMAN WHO LAUGHS 1 was created by Scott Snyder [Writer], JOCK [Artist], David Baroni [Colors], Sal Cipriano [Letters], JOCK [Cover], Greg Capullo & FCO Plascencia [Variant Cover]. The story is chilling from start to close. The artwork contains a classic depiction of the dark knight in blue-gray, and he is nearly always draped in shadow, like a ninja, amidst ominous sunset tones and cityscapes. The differences are subtle but intriguing, the tale mysterious, bloody, and thrilling. There has never been a Batman book quite like this. What begins the comic is a heart warming tale of a four-year-old Bruce running to break past his parents and Alfred’s linked arms amidst all of their resounding laughter. And then we are onto a rampaging runaway caravan of armored houses being trailered over a bridge and out of Gotham. Batman has to save the lives of the citizens plowed over while figuring out a way to stop the exporting of Gotham’s dead Jane and John Doe’s. Amidst the chaos, Scott Snyder adds the greatest Bat-joke this writer has ever heard when he tells Alfred the Batman Insurance Funds should be called ‘Dark Knight Returns’ in a nod to rank Miller’s book of the same name and Sean Gordon Murphy’s Emergency Bat Fund from The White Knight. A badass Bat-tricycle, a one-handed-throw of three batarangs, and some bone crunching moves make for a grand kickoff. But when the Batman gains access to the bodies, he comes upon a corpse of Bruce Wayne. This Bruce is his exact duplicate and an autopsy reveals that it is indeed he, down to the scars, except that this body is devoid of all the marks from Batman injuries that took place after Bane’s back breaking occurred. 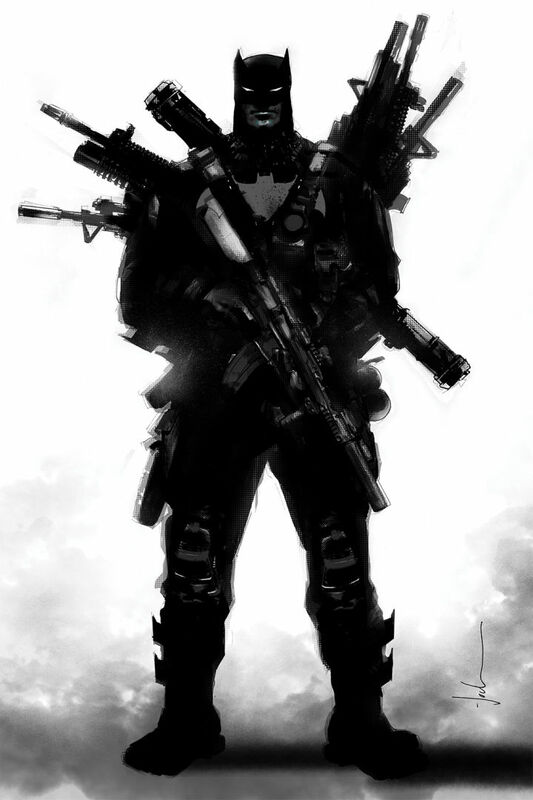 Meanwhile, The Grim Knight, a gray, gun-laden Rambo of a Batman breaks into Arkham and stabs skulls and kills guards and inmates alike as he approaches the Joker. But the dealing blow does not fall to him, but rather to the Batman Who Laughs, bearing a chain in one hand and an enormous ax, which he uses to split the Joker’s skull. And Batman is onto him. He even warns Jim Gordon of the ramifications of a world destroying version of himself from the dark Multiverse. But he has no idea how to go about stopping this psychopathic, albeit more humorous, embodiment. Batman does some good old fashioned Gotham detecting and discovers the dead Joker was a decoy. He locates the real one as he shows up at the Batcave. The Joker is granted access by the Batman offering him protection. The Joker’s trick gun shoots himself and, as he dies, his heart releases Joker toxin so that Batman ‘can become him’, can become like the Batman Who Laughs in order to win. And like when Bruce was a child, Alfred is no longer heard over the laughter. Head down to your LCS and grab ’em before these books are sold out (Red Shirt Comics in Port Jefferson has got them for us Long Island’ers!)! 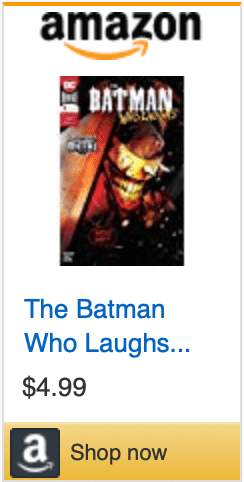 “THE BATMAN WHO LAUGHS 1 Review 10/10 HAHAHAHAHAHA!” was written by R.J. Huneke.